The jellyfish Periphylla periphylla, which can have strong ecological impacts on its environment, is ubiquitous in the Norwegian Sea and its range was predicted to extend northwards. The occurrence of P. periphylla in the northern Barents Sea increased since 2014 and, for the first time, several individuals were collected within a high Arctic fjord (> 78°N) in western Spitsbergen in January 2017. The low solar irradiance prevailing during the polar night and an increased inflow of relatively warm Atlantic water in the European Arctic since the last decade likely provide suitable conditions for the medusa to colonize Svalbard’s fjords during the winter months. However, light avoidance constrains the photophobic P. periphylla to deeper offshore areas during the midnight sun period. 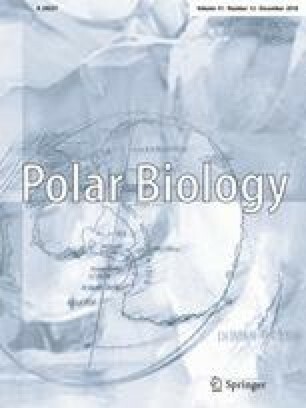 The current occurrence of P. periphylla in high Arctic fjords during the polar night will have a limited impact on marine ecosystems in the short term, but long-term effects are more uncertain if its abundance continues to increase. The online version of this article ( https://doi.org/10.1007/s00300-018-2368-4) contains supplementary material, which is available to authorized users. Pedro de la Torre and Daniel Vogedes provided logistic supports. Elena Eriksen provided valuable information regarding IMR samples. Bodil Bluhm, Marine Cusa, Néstor Santana Hernandez, Janne Søreide, and Malin Daase contributed to sampling in 2017. Calum Bachell, Dora Marie Alvsvåg, Øystein Sture, Kertu Liis Krigul, Jonathan Björklund contributed to fieldwork in January 2017 through the University Center in Svalbard course AB334/834. A particular thanks to Colin Griffiths for overseeing the collection of mooring data in Kongsfjorden since 2002. The study was co-funded by two projects supported by the Research Council of Norway (NFR): Arctic ABC (#244319) and AMOS (#223254), and by the Norwegian Biodiversity Information Centre project GooseAlien (#47-15-70184235). The mooring work was supported by the UK Natural Environment Research Council Oceans 2025 and Northern Sea Program with further support from NFR projects Circa (#214271), Cleopatra (#178766), Cleopatra II (#216537), and Marine Night (#226471). TJL acknowledges funding through the MARmaED project that received funding from the European Union’s Horizon 2020 research and innovation programme under the Marie Skłodowska-Curie Grant Agreement No. 675997. This study is a contribution towards the ARCTOS research network (www.arctos.uit.no), the Arctic Science Partnership (ww.asp.org), and the Ocean Frontier Institute funded through Canada’s First Research Excellence Fund. The results of this publication reflect only the authors’ view and funding agencies are not responsible for any use that may be made of the information it contains. All applicable international, national, and/or institutional guidelines for the care and use of animals were followed. This study was carried out with permission from the Governor on Svalbard and followed the strict regulations regarding health, environment and safety enforced at UNIS and UiT.